You were enjoying a backyard barbeque to celebrate the arrival of Summer when things took an unexpected turn – as you bit down on a rib sandwich, your lunch seemed to bite back, dislodging your dental crown. But luckily for you, this was only your temporary restoration and your dentist in Indianapolis gave you the preparation you needed if this situation were ever to arise. 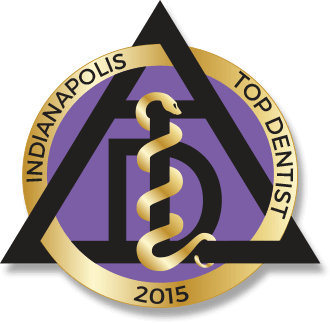 In this post, the team at Indianapolis Family Dentistry explain dental crown maintenance and what to do to prevent your crown from falling out, breaking, or becoming lost. Should My Dental Crown Fall Out? The crown was made improperly or the post that was implanted during a root canal cause the tooth to become brittle. Patients neglect caring for their teeth and crown properly, resulting in continued decay, which causes the tooth underneath the crown to fail, and makes the crown fall out – if the foundation isn’t in good shape, the house will always collapse. Patients may dislodge crowns by using their teeth when scissors are really the tool needed, by chewing on ice, pencils/pens, or chewy/tacky foods that can pull the crown away, or by flossing improperly and wiggling the crown free. Brush your teeth and crown gently twice a day, for two minutes. Floss at least once daily, and be sure to slide the floss around the sides of your teeth and crown (making a C-shape) rather than snapping floss in between your dentitions and restorations – snapping and pulling can dislodge your crown. Never chew ice with any of your teeth, including your crown. Try to do most of your chewing on the side of your mouth where the crown is not located. Avoid tacky foods like caramels and salt water taffy, which can stick to dental restorations and pull them free. Don’t use your teeth or crowns to chew on pencils or pens, and never use your teeth to do a job that scissors should do. If you need to chew on something, try sugarless gum (and chew on the side where your crown isn’t located) or consider getting a mouthguard or nightguard if you have a tendency to grind your teeth. If you follow the steps above to maintain your crown, your restoration can last up to 20 years. 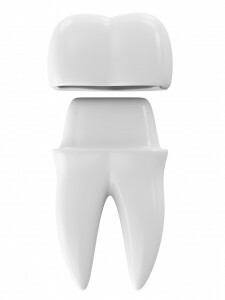 If you have questions about dental crowns or need to have one placed again, give us a call or schedule your appointment with Indianapolis Family Dentistry today!